Hunger is a human problem with millions of faces, but two related numbers can illuminate the size of the problem in the Quad Cities - and the heartwarming community generosity that's fighting it. The first number: Christian Care served nearly 56,000 meals last year at its meal site, according to Executive Director Elaine Winter. The second: "Our budget [for food] is about a thousand dollars a year," she said. The site at 2209 Third Avenue in Rock Island serves 19 meals week. (There's no lunch on Saturday or Sunday.) On average, then, it was feeding more than 57 people per meal. The cash cost per meal? Less then two cents. What this one site illustrates is that food assistance beyond what taxpayer-funded government programs provide is a real, persistent need in the Quad Cities. And the community - through churches, charitable organizations, and individuals - has been meeting the need. The bad news is that hunger appears to be growing. The infrastructure for feeding the hungry in our area is undoubtedly rich. On the front lines, there are nine meal sites in the Quad Cities proper where anybody can get a hot meal. And there are 29 food pantries in Scott County, with another 16 in Rock Island County. Most serve specific neighborhoods, and they're typically open between one and five days a week for a few hours at a time. Over those is a support network. Twenty-five food pantries - run by 400 volunteers - in the Quad Cities are associated with Churches United, which provides both food and monetary assistance. (For example, Hy-Vee recently donated 1,000 frozen turkeys to Churches United, which then distributed them to its food pantries.) Each Churches United pantry spends at least $12,000 a year acquiring food beyond what it receives in direct food donations. And much of the food that is distributed by local food pantries comes from River Bend Foodbank in Moline, which serves five counties in Iowa and 17 in Illinois. Food-assistance programs can access donated food (for example, what is collected in the annual Student Hunger Drive) for a "shared maintenance" cost of 18 cents a pound. Qualified agencies in Illinois can, through a state program, get food with no shared-maintenance cost, and the equivalent program in Iowa costs agencies between 4 and 14 cents a pound. Programs can also purchase items that typically aren't donated in bulk - for instance, 12 canned hams for $30.66, or 24 cans of chicken-noodle soup for $12.16. Beyond serving as a source of food for meal sites and food pantries, River Bend also has three Kids Cafés serving evening meals four nights a week during the school year and a Backpack Program that provides 1,600 packs of take-home weekend food to children through nearly 40 schools. According to Tom Laughlin, executive director of the River Bend Foodbank, roughly half of the food his organization distributes is given away for free - without even shared-maintenance costs. Of course, none of these would be possible without the generosity of the community. Hundreds of individuals, families, businesses, community groups, foundations, and churches donate their time, money, cooking skills, and food to meal sites, food pantries, Churches United, and River Bend. But this network is being stretched pretty thin. "Not all of our food pantries have been able to give families everything that we've normally given them before," said Anne Wachal, interim executive director of Churches United. "We've had to cut back a little bit as well, because either it's costing more to purchase the food, or it's not available, or we're trying to get our food to last a little bit longer because we're seeing more people coming in." Laughlin said his organization will distribute approximately 8 million pounds of food this year - 1 million pounds more than last year, and almost double the amount before the most recent recession. "Demand just keeps increasing," he said. 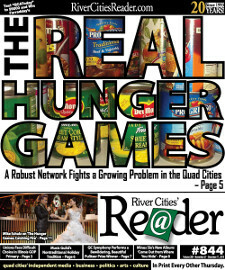 According to a 2013 study by Feeding America - of whose food-bank network River Bend is a member - the Quad Cities area fares relatively well in "food security." The report defines food insecurity as "the household-level economic and social condition of limited or uncertain access to adequate food." In other words, these are not necessarily people who need to use food pantries or meal sites, but their situations are tenuous enough that they're not far from needing to. As Pam LaRoque, who coordinates the City Center Ministry food pantry in downtown Davenport, said, many families are just a few "paychecks away from using a food pantry." Overall, Scott and Rock Island counties in 2011 had overall food-insecurity rates in the lowest range (4 to 14 percent of the population). But the picture was more grim for children, with Scott County in the 15-to-19-percent range and Rock Island County in the 20-to-24-percent range. Specifically, Scott County's overall food-insecurity rate was 14.0 percent, and its rate for children was 19.0 percent; an estimated 42 percent of food-insecure children in the county are not eligible for federal nutrition assistance. Rock Island County had an overall food-insecurity rate of 12.0 percent and a child rate of 19.8 percent; the study estimated that 26 percent of food-insecure children are not eligible for federal nutrition assistance. Beyond the potential hunger included in "food insecurity," a better measure of actual hunger is the use of food-assistance programs. In 2012, for example, Churches United had 31,314 visits to its affiliated food pantries, Wachal said. (Households can visit a food pantry once every 30 days.) Through October, it had 29,072 visits in 2013. The number of people using Churches United food pantries, she noted, has grown each quarter in 2013 - from 7,522 to 8,608 to 9,483. "I've not seen it like this in several years, where every quarter we rise by almost a thousand," she said. "That's pretty unusual." She added that with cuts to benefits in the Supplemental Nutrition Assistance Program (SNAP, also known as food stamps) hitting November 1, demand will grow even more. One food pantry in Illinois, she said, saw a 30-percent increase in visits on that date - all of them first-time visitors. Churches United was on a pace through October to have nearly 35,000 visits in 2013, but that number will likely be even higher with the SNAP cuts. Visits in 2010 were 29,120, and in 2007 they were 26,415. Christian Care's site saw its annual meals rise from 50,928 in 2009 to 56,586 last year. As robust as the Quad Cities food-assistance system is, Laughlin said he's skeptical that it can feed all those who are hungry as the number of them grows. He said area food pantries will see increases in demand of 10 to 15 percent this year. "There's a gap because of ... federal cuts. SNAP is the first line of defense against hunger, and [with] the amount of money they're cutting, people are going to feel it. The food pantries, they were set up as a supplemental resource. They weren't set up to be the primary source of feeding people in a community." People involved in feeding the hungry say that there is a wide variety of people getting food assistance in the Quad Cities. Wachal gave a few examples among Churches United's clientele: families with two children and household incomes of $40,000; retired grandparents raising grandchildren; widowed or divorced women with few job skills. At the food pantry she coordinates, LaRoque said she sees many people from downtown Davenport's senior high-rises, and people on Social Security and disability. Winter said Christian Care's meal site serves many low-income families, veterans, the homeless, abused women, and people who've fallen on hard times. "We see a lot more people toward the end of the month, because food stamps have been used up, or whatever assistance they might have gotten through the month has been used," she said. For a broader perspective, Churches United surveyed its food-pantry users over the summer, with more than 1,300 responses. While the survey wasn't a scientific random sample, the volume of responses was certainly large enough to be meaningful. Nearly 95 percent said the food pantry met their needs. Demographically, visitors skewed older. Roughly a third were between the age of 36 and 50, while more than 46 percent were 51 or older. More than 31 percent of those surveyed were raising and/or feeding grandchildren - including 37 percent of those older than 50. Almost 60 percent reported being unemployed in the past six months - which means that more than 40 percent of those surveyed had been continuously employed but still needed food assistance. Laughlin estimated that 40 percent of households that use food pantries have at least one member who's employed full-time. "Many clients are faced with life-essential choices, between food and rent, food and medical care, food and day care, food and transportation," he said. Often among those priorities, Wachal said, "food is last on the list." The nature of the holiday season means that people are particularly generous this time of year. And there's no doubt that people need more food assistance in the winter, with higher utility bills cutting into many families' food budgets. But summer is also difficult for families raising children, as the kids aren't in school and don't have easy access to free or reduced-price meals. At LaRoque's food pantry, for example, July was the busiest month so far in 2013. She stressed that hunger doesn't hit only near the holidays, and food-assistance programs need donations and volunteers throughout the year. "As blessed as we are during this time of year getting donations, hunger is a year-round thing," she said. "We appreciate people remembering the hungry in April, in July, in September." Locations and times for area meal sites and food pantries can be found at RiverBendFoodBank.org/mealsites.htm.